One of the benefits of shooting destination weddings is the exposure one has to the different cultural mentalities of weddings. 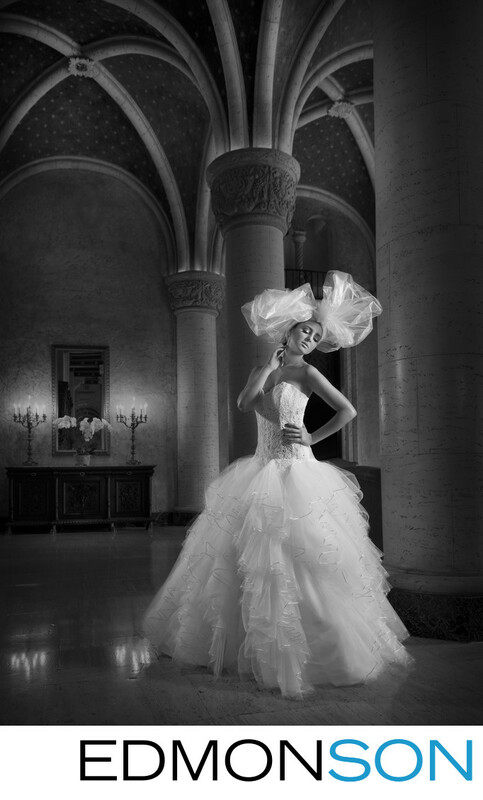 The Cuban influence in Miami brings a fashion flair to traditional elements like the veil. This photo, made in the lobby of the Biltmore Hotel in Coral Gables, FL, features vaulted ceilings, travertine floors, and marble columns. Since this venue is a National Historic Landmark, it was important to position the bride in a way that featured the incredible architectural elements without her becoming lost in that scene. In general, for Western audiences, our eyes enter a frame or photography from the top left corner and move naturally down toward the bottom right. By placing her on the right side of the frame, the viewer's eye naturally comes to rest on her and her soft expression. By inviting her to close her eyes, the story stays open to interpretation and becomes a more interesting moment in time. You will often see inexperienced wedding photographers shoot into a woman's armpit. By raising the arm farthest from the camera, I mirrored the feeling of the ceiling while also posing her in an attractive manner. The flowers, candle, and mirror in the background provide a depth to the scene and suggest the warm feeling she is enjoying. Location: Biltmore Hotel Coral Gables. 1/125; f/4.0; ISO 800; 32.0 mm.